Inder Loves Folk Art: What I'm up to. Before you roll your eyes at this 2.5 year WIP: I am almost done! For real! For real, for real! * No, really. Hold tight for the final reveal, folks. Joe is almost four, and his quilt is finally, almost done. Compared to my last quilt, which took 13 years to complete, I did this at light speed, people! Recently, I've had some discussions about hand-quilting technique with some friends, so I thought it would be fun to take a few photos that show my technique. 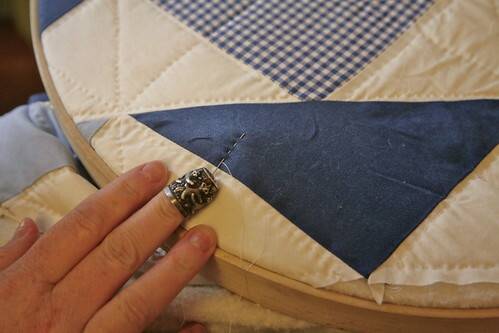 I use a 17" inch diameter quilting frame - just a simple number, and I use traditional "Betweens" and Guterman's Hand Quilting thread, which comes pre-waxed (and thus less likely to snarl up). I hand-quilt old school, which is one of the seven habits of an ineffective quilter, of course! 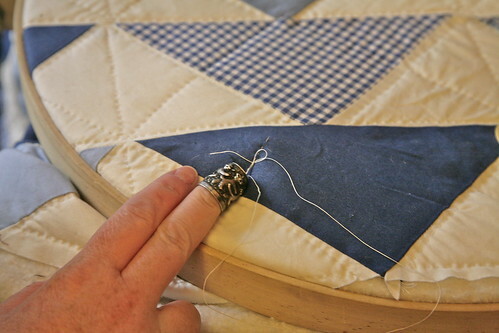 In the shot above, you can see how I push on the quilt from below to allow the needle to "rock" and pick up multiple stitches. I inherited this thimble from my grandmother, and I love it. It has baby raccoons frolicking on it. And it fits my middle finger perfectly, just as it fit my grandmother's. It does a great job of protecting my fingers. Before I learned to quilt, I imagined that thimbles were necessary to protect against the sharp end of the needle. 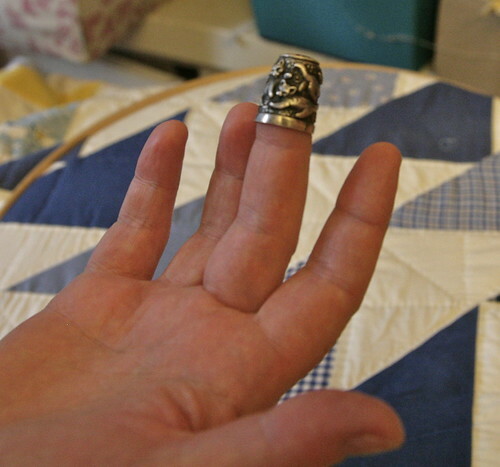 Now I realize that actually, it's the eye end that you really need a thimble for (some quilters use both). Sometimes I see books with subtitles like "Not your grandmother's quilting!" and all I can think is, "But I love my grandmother's quilting! "Seriously, if I am ever HALF as good with a needle as my grandmother was, I would be quite pleased with myself (it's not likely to happen, mind you; she was that good). * What was my motivation to finish Joe's quilt, you ask? All I can say is, it had nothing to do with wanting to start a new quilt. Nothing. Cough cough. Hahaha! No problem! Just send it over, it will be done sometime in the next 20 years. I used that Guterman hand-quilting thread too, it was rather good I thought. Your stitching looks very lovely and small and even! That thimble is awesome. An heirloom with frolicking baby raccoons, oh yes. Be honest now, have you bought the fabric for the new quilt project?? You have not really mastered the seven habits of highly ineffective quilters if you still think you can have only one project going at a time. 13 years? And now 2.5? I bow before you, truly! My one and only quilt (a hexie) has now been going for 35 years - I started it when I was 5, and I really do hope to finish it one day! I love the thimble... What a treasure! When I quilt always completely ruin my thumb nails and oh the callouses as I've never learned to use a thimble. Maybe I just need to find one with frolicking baby raccoons ... Your stitching is lovely. Skills passed down through generations, so wonderful when it still happens. Maybe someday you will have a grandchild using that thimble!